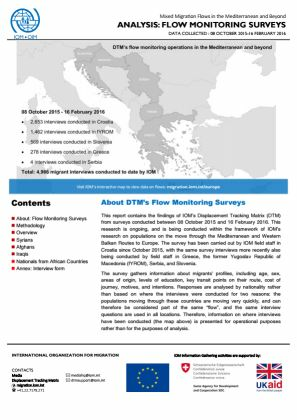 This report contains the findings of IOM’s Displacement Tracking Matrix (DTM) from surveys conducted between 08 October 2015 and 16 February 2016. This research is ongoing, and is being conducted within the framework of IOM’s research on populations on the move through the Mediterranean and Western Balkan Routes to Europe. IOM field staff in Greece, fYROM, Croatia, and Slovenia amassed interviews with 4,966 migrants and asylum seekers, of which 305 people were interviewed over the week from 8 – 16 February. Individuals of Syrian, Afghan, Iraqi, nationalities comprised 91% of all respondents. The analysis of these three nationalities is presented in the following document.